Perhaps I should explain. 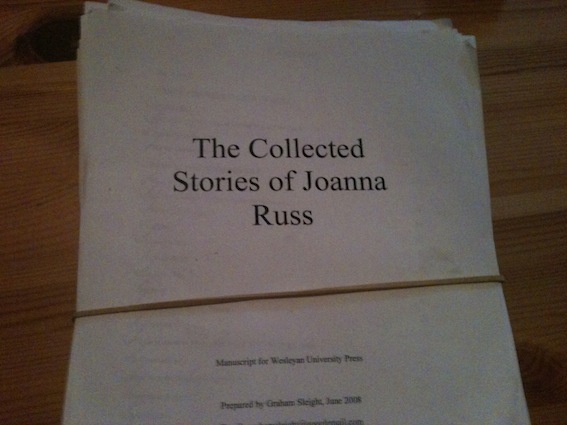 In, I think, 2006 or 2007, Farah Mendlesohn very kindly asked me to write a chapter on Joanna Russ’s short fiction for a book she was editing; this became On Joanna Russ (Wesleyan, 2009). At the time, Wesleyan were reprinting a number of Russ’s novels. Via Farah, a request came through. Wesleyan were interested in publishing a Collected Stories of Joanna Russ, but the bibliography seemed a bit complicated. Would I be interested in working with Joanna to sort it out? I would, I said, and began corresponding with Joanna. Over the course of several years and a lot of airmail post, we worked out the contents list, the texts to be used, and the scholarly apparatus. In addition to the published collections, the book would contain about another collection’s worth of unpublished material. (About a quarter of this Joanna referred to as “Ghastlies”, meaning early work she wasn’t that keen on; but most of it was astonishing, like the late hilarious story “Invasion”. Most is not from the sf field but rather from small literary/feminist magazines.) I sent the completed MS off to Wesleyan in late 2008 and waited. After a long pause, Wesleyan said that they were passing on the book. I understood why – it was a big project (c. 900 pages), Wesleyan are a small company, and they, like everyone else, are under financial constraints. In the last exchange of letters I had with Joanna, she said I was welcome to try to find alternate publishers for the book. Since her death in April, things have been on hold while the legal wheels have turned and executors have been appointed; of course, it’ll ultimately be the decision of the estate and Joanna’s agent how the book is published. Watch this space. I’m biased, of course, but I think it’s a book of superb stories; doing the work on it so far has been a huge honour, and I really hope it can move off my living-room table soon. The title of this post, by the way, is from a poem by Dorothy Gilbert that appeared in Robert Silverberg’s New Dimensions 5; Joanna wanted it to be the epigraph at the front of her Collected Stories. I hope it still will be. ~ by grahamsleight on July 20, 2011.